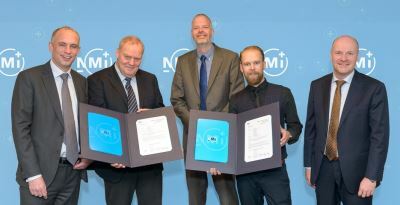 FMG received the very first OIML Certificates of Conformity based on the R 137 issued by the NMi, a worldwide premiere. 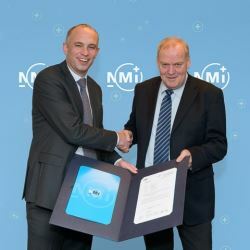 These Certificate of Conformity were handed out to Raymond Richards from Flow Meter Group by NMi’s Managing Director Arjan van Breukelen. The Certificates of Conformity cover both the positive displacement meters and the turbine meters which Flow Meter Group can provide. Therefore the complete product range from G6 upto G16000 is approved by OIML R 137 and therefore according to the MID standard as well. OIML R 137 is the new approval standard for gas meters. In 2014, the test report format as well as the Certificate of Conformity system for the R 137 have been completed. The document covers diaphragm gas meters, turbine gas meters, ultrasonic gas meters and any other type of gas meter. Manufacturers whose gas meters are tested according to OIML R 137 , underpinned by a Certificate of Conformity, will be able to gain fast market access in countries outside Europe, such as Australia, Canada, the USA, China and Russia. The R 137 becomes more and more important in Europe as well. By applying the cross reference as issued by Welmec, the document can be used as normative document for the MID. Based on the R 137 examination an MID approval can be issued. In comparison with the existing harmonized EN Standards the OIML R 137 is newer, contains the latest updated requirements (e.g. for EMC, software and pertubation testing) and is therefore the perfect future proof match for meter manufacturers.